A fern-leaf form of 'Gold Mops', this forms a vigorous golden mound. 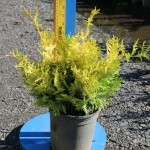 The bright yellow foliage has a soft texture, and holds its color well in the summer and winter. It prefers a well-drained site. Use for foundation plantings or a colorful accent in the landscape. Discovered in Ohio.